TKap is a protocol converter that interprets data coming from the DDCMP protocol and converts them into SDS messages and vice-versa. The information is processed to minimise the number of SDS messages needed to transmit all the data. Housed in a standard metal 19” rack casing, it is easily mounted in any installation with space for a 4U high unit. 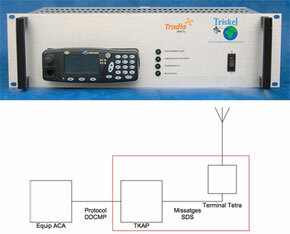 It incorporates a Tetra radio transceiver for incoming and outgoing SDS messages.